Histone methyltransferases (HMTs) play a critical role in many diseases. Dysregulation of histone methylation and the subsequent alterations in epigenetic states can cause gene expression patterns that drive a variety of cancers, endometriosis, osteoporosis, osteoarthritis and rheumatoid arthritis, cardiovascular disease, and autism, to name only a few. In this light, a global assay for HMT activity that is not limited to detection of a single methylated substrate is needed for high-throughput drug discovery screens. This can be achieved by detecting S-Adenosyl-L-homocysteine (SAH), which is produced when S-Adenosyl methionine (SAM) serves as a methyl donor in HMT-catalyzed reactions. There are technical barriers, though. Detection must be specific enough to discern between SAH and SAM, and the method must be sensitive enough to accommodate the slow reactivity of HMTs. 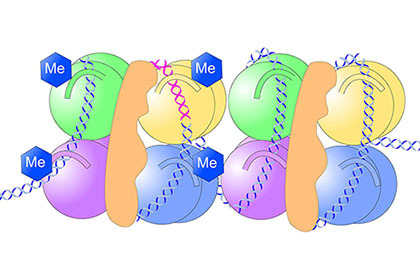 The AptaFluor Methyltransferase Assay uses a SAH-sensing RNA aptamer, or “riboswitch,” that binds SAH with nanomolar affinity and exquisite selectivity. Detection is made possible by engineered split-aptamer sensors that transduce SAH binding into positive time-resolved Förster resonance energy transfer (TR-FRET) signals. The modified SAH riboswitch discriminates between SAH and related nucleotides, including SAM, which makes unambiguous detection of SAH possible in the presence of excess SAM. The other two high-throughput screening-compatible assays used for comparison used either immunodetection with an HTRF® readout or a coupled enzyme assay with a luminescent readout. While all three assays detected PRMT4 activity in 2-hour reactions using 200 nM SAM, only the AptaFluor assay enabled detection using significantly less PRMT4 (EC50 = 2.8 nM) due to 20-fold higher sensitivity compared to the other two methods. Requiring lower amounts of enzyme holds considerable value in efforts that involve high-volume screening and dose-response measurement with high-affinity inhibitors. This higher sensitivity also supported lower input enzyme requirements at both low (200 nM) and high (2 μM) concentrations of SAM. The implications for PRMT4 inhibitor screening are intriguing. A recent quantitative mass spectrometry study profiled PRMT4 substrates in breast cancer cell lines, identifying more than 130 substrates, many of which are known to contribute to cancer initiation and progression. Clearly, the ability to identify and evaluate PRMT4/CARM1 inhibitors will require sensitive, robust, and reproducible assay strategies. The 5-year survival rates of advanced (stage IV) invasive epithelial ovarian cancer are currently very low, at 19 percent according to the American Cancer Society. In the face of such grim statistics, the need for techniques that could accelerate drug discovery is clearly evident. Ma F, Zhang CY. 2016. Histone modifying enzymes: novel disease biomarkers and assay development. Expert Rev Mol Diagn. 6(3):297-306. Colón-Caraballo M, et al. 2018. Effects of histone methyltransferase inhibition in endometriosis. Biol Reprod. 99(2):293-307. Gao Y, Ge W. 2018. The histone methyltransferase DOT1L inhibits osteoclastogenesis and protects against osteoporosis. Cell Death Dis. 9(2):33. He D, et al. 2018. Increased DOT1L in synovial biopsies of patients with OA and RA. Clin Rheumatol. 37(5):1327-1332. Jiang DS, et al. 2017. The promising therapeutic agents for heart diseases: Histone Methyltransferase inhibitors. Int J Cardiol. 239:6. Katoh M. 2016. Mutation spectra of histone methyltransferases with canonical SET domains and EZH2-targeted therapy. Epigenomics. 8(2):285-305. Zeng H, Xu W. 2015. Enzymatic Assays of Histone Methyltransferase Enzymes. In: Epigenetic Technological Applications, Academic Press, 333-361. Nakayama N, et al. 2018. Cancer-related transcription regulator protein NAC1 forms a protein complex with CARM1 for ovarian cancer progression. Oncotarget. 9(47):28408-28420. Shishkova E, et al. 2017. Global mapping of CARM1 substrates defines enzyme specificity and substrate recognition. Nat Commun. 8:15571. Epigenetics: Making Bad Memories a Thing of the Past?